What Are the Adjective Questions? Knowing the adjective questions will help you understand and identify adjectives. Before we look at the questions, we need to make sure that you remember what adjectives are. The wise, handsome owl had orange eyes. 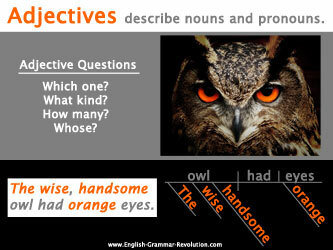 The, wise, and handsome are adjectives telling us more about the noun owl. Orange is an adjective telling us more about the noun eyes. 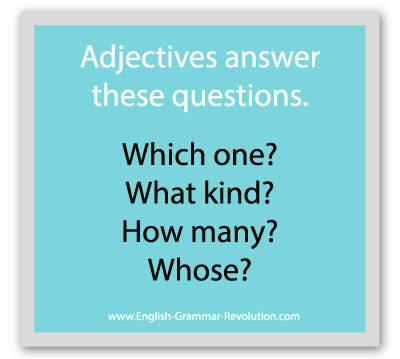 Adjectives usually answer one of the following questions about the noun or pronoun that they are modifying. Alice wore the colorful outfit. The and colorful are adjectives modifying the noun outfit. Baby is an adjective modifying the noun food. Note that words can act as different parts of speech in different sentences. In this sentence, baby is an adjective, but you can also use baby as a noun (She is our baby.) or a verb (Don't baby me!). Alice drank several sips of water. Several is an adjective modifying the noun sips. I can't find Alice's toys. Alice's is an adjective telling us more about the noun toys. 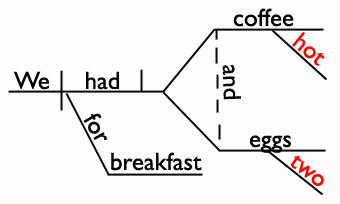 Sentence diagrams give us a way to show how the words in our sentences are related to each other. Diagramming adjectives helps you see that they modify nouns and pronouns. Adjectives go on a slanted line under the noun or pronoun that they are modifying. We had hot coffee and two eggs for breakfast. My green and white book fell. These pages will help you! I hope this lesson helped. Thanks for stopping by!